A former Wales Sevens representative and Cardiff RFC prospect, Cuthbert came to wider attention in 2011 with the Blues. As an attacking threat he underlined his credentials during the region's Heineken Cup campaign - scoring a brace as they secured a quarter-final berth with victory over Racing Metro. Wales' senior management was quick to take notice and he made his bow in their December international against Australia. There he replaced George North in the second-half, but it was the slot vacated by the retired Shane Williams that became his for the opening game of the 2012 Six Nations. At well over six feet he represented a change of style from Williams' dancing feet and low centre of gravity, but his domestic form, pace and finishing prowess stacked up for Warren Gatland. Cuthbert went on to score his first international try against Scotland at the Millennium Stadium. And Cuthbert saw his stock rise further with continued high level performances. He started against England and scored a try in their final two matches of the tournament against Italy and France. 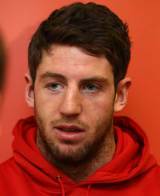 As Wales' attacking instincts deserted them, Cuthbert struggled to make an impact for the rest of 2012. But as Wales rediscovered their creative spark in the 2013 Six Nations Cuthbert proved his try-scoring prowess once again. He scored two tries in Wales' tournament-deciding win over England on the final day, after scoring twice earlier in the championship.His strong international form was rewarded with a place in Warren Gatland's British & Irish Lions squad to tour Australia. Cuthbert impressed in the pre-Tests tour games, even if question marks over his defence were raised, posed particularly by Luke Morahan, during the Lions' narrow win over the Reds. Following an injury to rival winger Tommy Bowe, Cuthbert started the first Test against the Wallabies and scored a terrific try as the Lions went 1-0 up in the series. However Bowe made a remarkable recovery from a fractured bone in his arm and replaced the Welshman for the final Tests as the Lions secured a 2-1 series triumph.